This topic contains 7 replies, has 3 voices, and was last updated by Kody Foster 7 months ago. 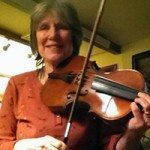 Anyone on here working on Johnny Gimble’s “Barefoot Fiddler”? I’m from around the same area Gimble was born, it would be cool to be able to play this tune at a fiddle concert in our area. Hi Kody, Nancy Parker sends this PDF of Johnny Gimble’s “Barefoot Fiddler.” It’s a cool tune! But my question to barefoot fiddlers, if you jump up and start dancing, do you want sugar on that floor? Or would you worry the possums might come up and try to lick your feet later on, while you were resting up. Hahaha Cricket. From the lyrics (repeated “Put your shoes on”), I would say that the fiddler has some sort of smelly foot fungus. Probably from walking barefoot into bathrooms at fiddler festivals. A little sugar might help that situation (or make it a lot worse…lol)! Thank you, John and Nancy. I’ve got most down by ear with the YouTube playback speed slowed down. This pdf has help me big time!